I thought I would do a series of posts on my favourite things, I will do one or two per month about the things I love and hold dear. I am a funny one when it comes to jewellery, I love the stuff and could spend lots of time cooing over the displays in shop windows and perusing catalogues etc, and I seem to have quite a bit of it as well. But do I wear it very often? Not really. For some reason I hardly ever put jewellery on, or I forget/am in too much of a rush or I'm just too damn lazy. For me I love pieces that I can put on and keep on, sleep and shower in. I know that may seem so boring to all you fashionista's out there but I'm not the first and won't be the last to say that. I have a little crystal nose stud I wear all the time, along with a pair of diamond studs in the 2nd lobe hole, a plain stud at the top of my ear, a heart ring on my right hand and a ring in my belly button and that is it for the most part. I have however been wearing a silver DKNY watch for the last 7 months that I am very fond of because my boyfriend got it for my birthday and I have worn it every day since. I digress, back to the subject. 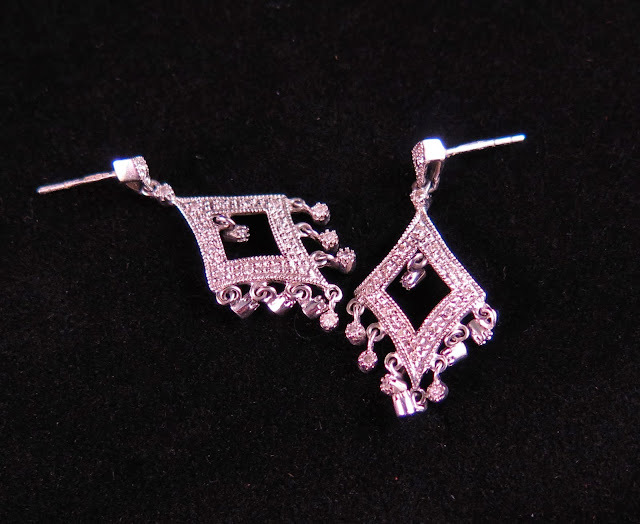 The above pair of rather pretty little earrings are one of my favourites. They are little white gold and diamond drop studs and I adore them. My nan bought me these years ago and she really hit the nail on the head with them. They are just my cup of tea, white gold is my preference because of my pale complexion and I love the stunning diamond shape. 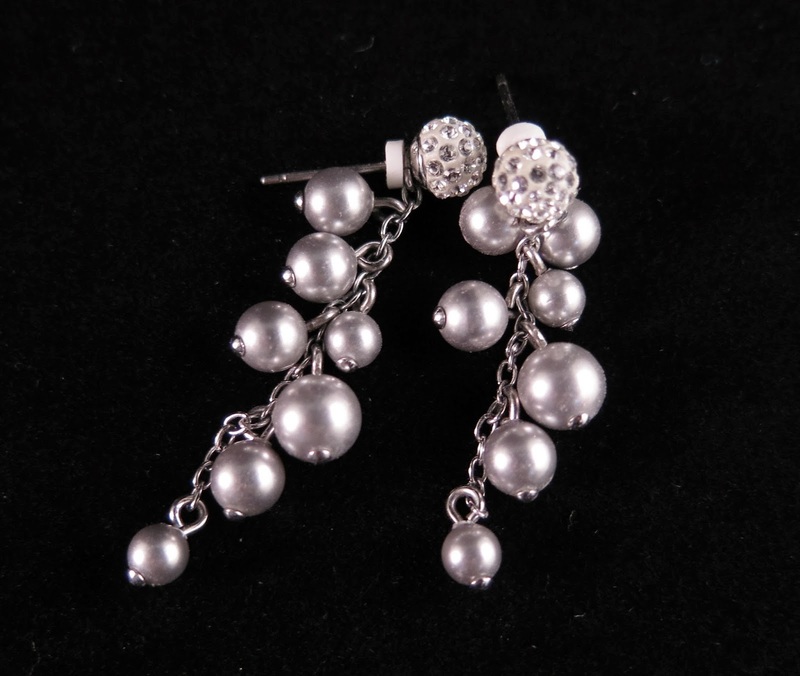 I have worn these a lot over the years, they are great for teaming with a nice dress for a formal event like a wedding, or even for going out for a meal. I have had quite a few compliments when I have worn them about their unusual shape, and above all of that they hold a lot of sentimental value. This pair are another favourite of mine that I wear a lot! I saw these in the window of the swarovski shop last January and kept looking every day on my way past. I had fallen in love with them, I loved the pale silver grey colour and the delicate little beads and the splash of sparkle on the stud topped it off like a perfectly iced cake (with a cherry on top of course), but with the expense of Christmas and the cost of starting a new job and having to haul myself quite a long way for the first month before I got paid I couldn't justify buying them for myself. One evening my boyfriend met me for dinner and we stopped at the window and I think he could see how much I liked them and so he bought them for me. I was so thrilled and have worn them countless times over the last 12 months. They are really special to me, every time I wear them I think about how good he is to me and how lucky I am. Oh I almost forgot to say that the earrings come apart and can be worn as studs without the beaded part, how nifty is that? Two pairs for the price of one, although I have to admit I always wear them as they are. Right my mission tomorrow is to wear them as studs! 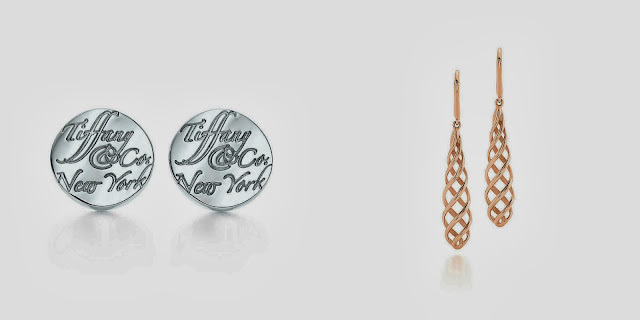 I have been browsing at the tiffany website today and have a little wish list of earrings from there now. Do you have a favourite pair of earrings that you couldn't be without?